If you’ve been suffering from breakouts and can’t pinpoint the exact reason for it, dirty makeup brushes and beauty blender could be your problem. Your dirty makeup brushes are fifty shades of unhygienic. Tossing them in the trash when they’re dirty would get expensive. A more practical solution is to learn how to clean makeup brushes by yourself at home. 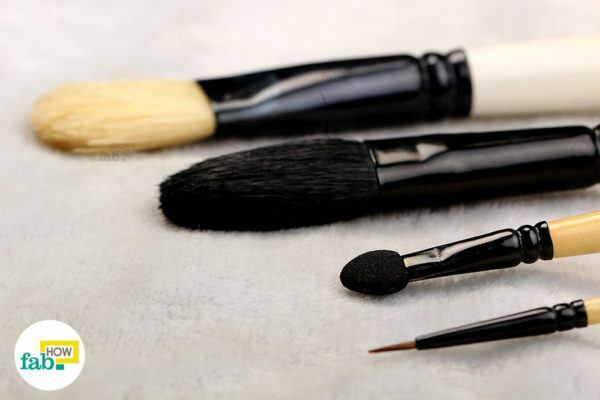 From brush-cleaning gloves to expensive soaps, makeup artists employ various methods to keep their makeup brushes clean. Since cleaning their makeup kit is a cost of their profession, it’s alright for them to spend a small fortune on cleaning methods. It’s just as critical for everyday makeup users to deep clean their makeup brushes, but it need not be a costly endeavor. 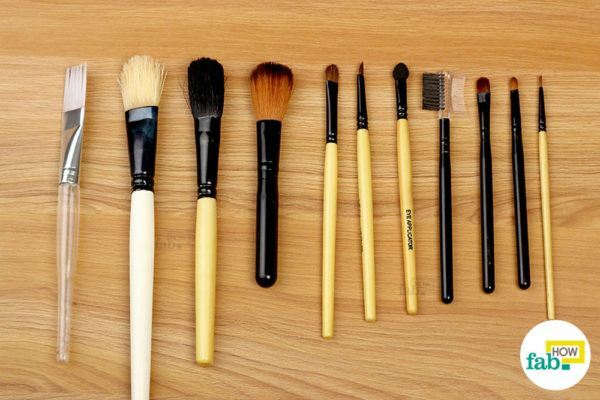 An average makeup brush harbors more than old makeup, dirt, and debris. The brushes pick up dead skin cells and bacteria from your face with each use. These bacteria multiply overtime and get smeared on your face each time you use them. This can very well lead to acne and breakouts even when you take other measures to deter them. 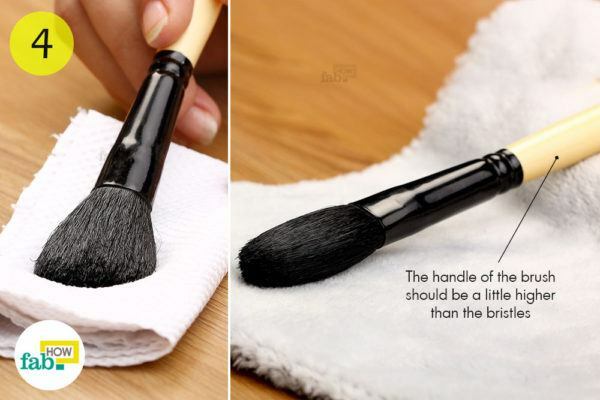 Regular users should clean makeup brush weekly at the very least. The cleaning frequency depends on how often you put your makeup brushes to use. 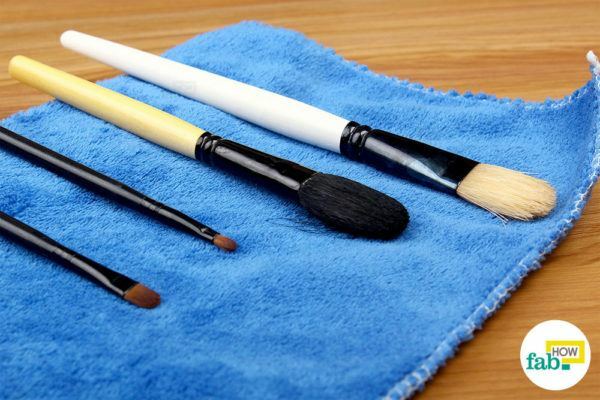 Here are three easy cleaning methods that employ cheap and readily available ingredients to help you clean makeup brushes like a pro. 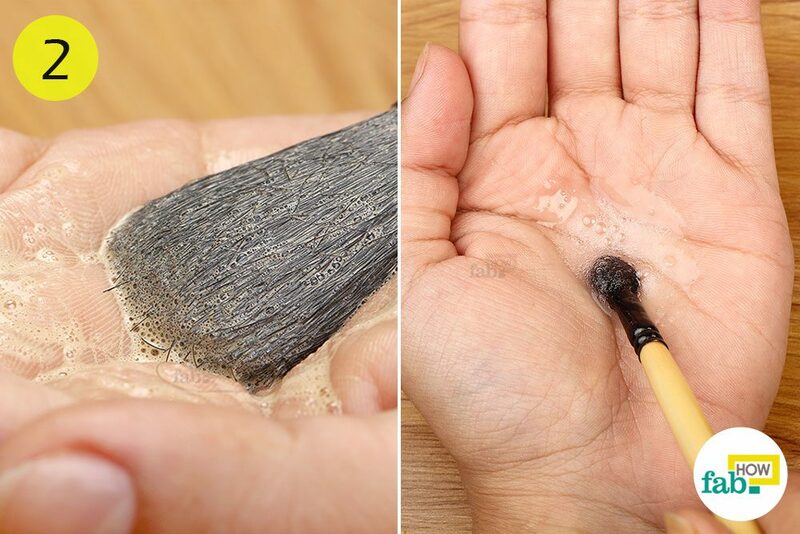 We tested 3 popular methods to clean a makeup brush. One method may be more effective than others, depending upon the condition of your brushes. 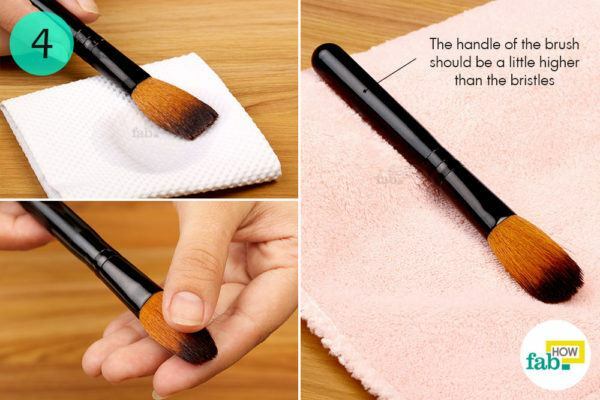 This should be your go-to method for your regular makeup brush cleaning. 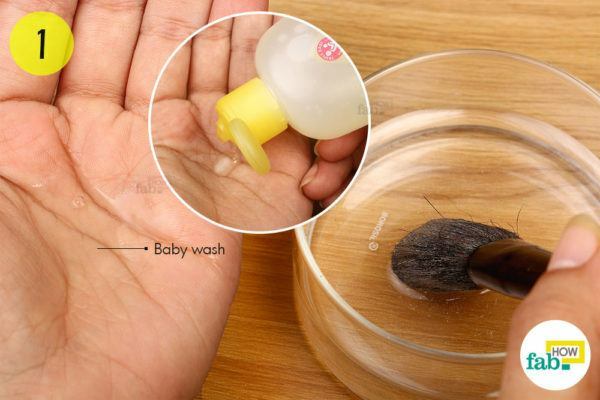 Squirt a little baby wash in your palm. Baby wash is a mild cleaner that you can use on your makeup brushes without any worry. 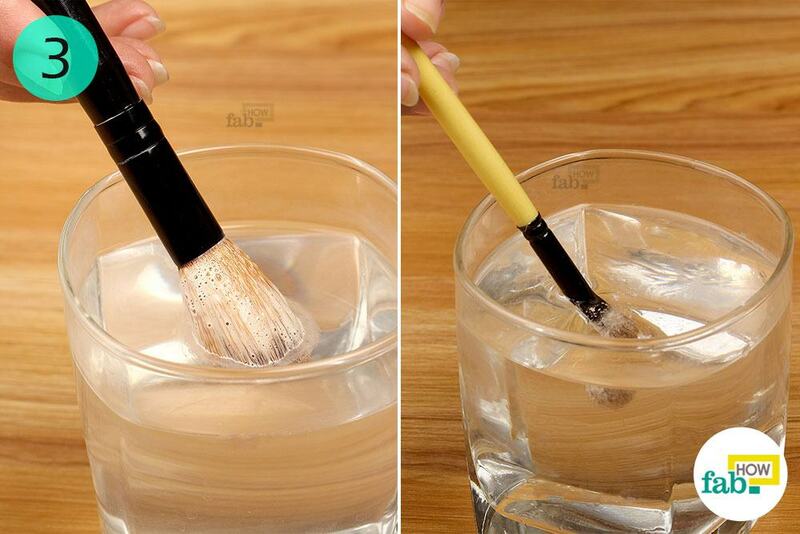 Wet the bristles of your makeup brush with a little water. Swirl the wet makeup brush around in the baby wash in your palm. 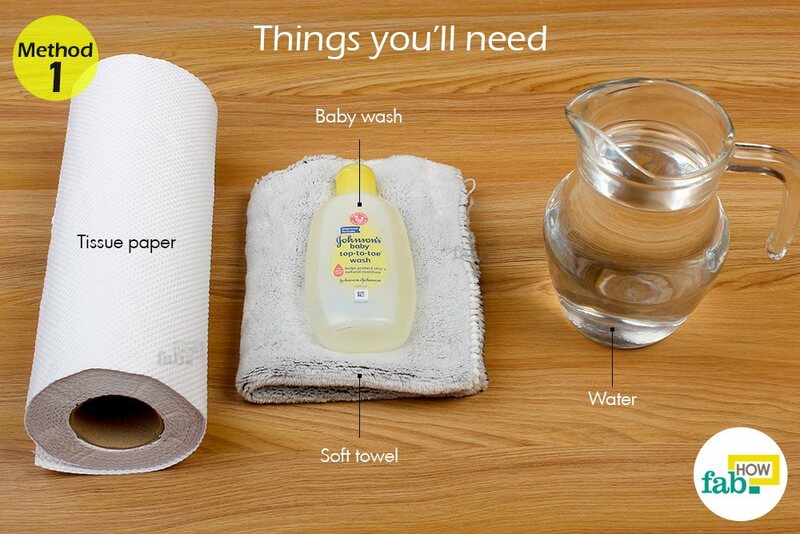 The baby wash will foam on contact with the brush. After a couple of swirls, you’ll notice that the foundation and other makeup stuck to your brush will start streaking into your palm. The baby wash dissolves and loosens the caked-on makeup, cleaning your brushes thoroughly. You may also give the brush a slight squeeze between your fingers and your palm to drive out the old makeup and dirt. 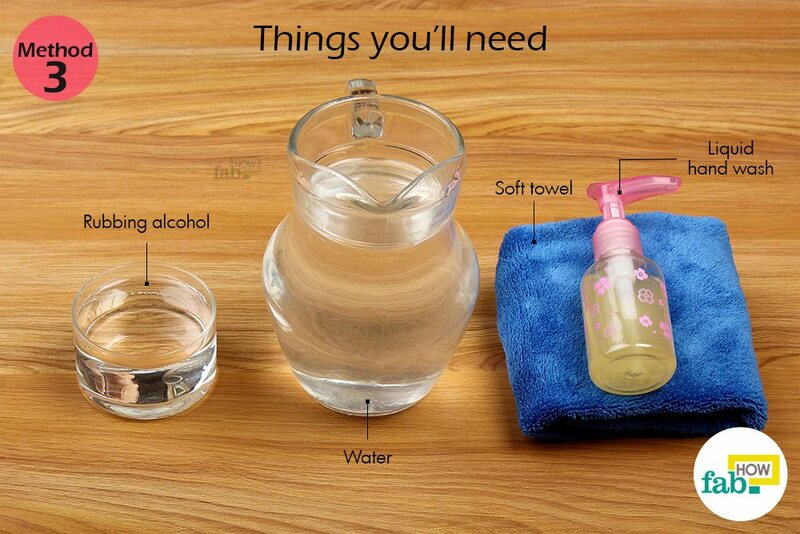 To rinse the baby wash out of the bristles of your brush, swirl it in a glass of clean water. You may also rinse the brush under running water until the water runs through it clean. Remove the excess water from the brush by dabbing it around on a folded paper towel. After that, let the brush air-dry on a soft towel. 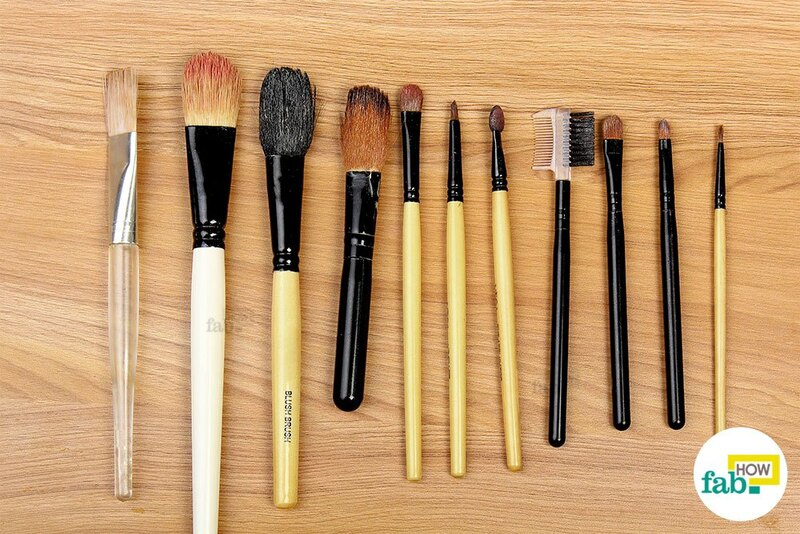 If you have more than one makeup brush, use this process for each, cleaning them one by one. Lay the brushes on their side on a towel instead of keeping them vertical. The handles of the brushes should be a little higher than the bristles. If you try drying them vertically with the bristles pointing down, they end up getting crooked; if the bristles point upward instead, water can get into the ferrule and loosen the glue that holds the bristles together. 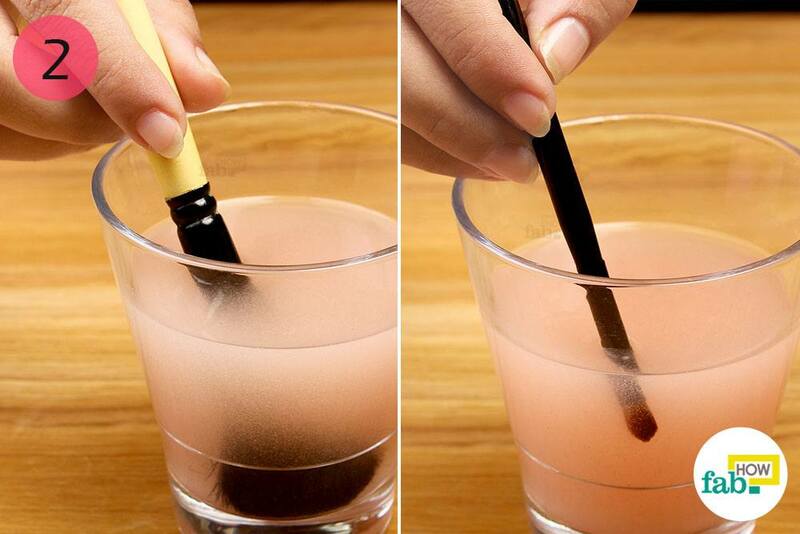 If there is some residual makeup in your brushes that you don’t think will come out easily, give this method a try. Mix together 1 tablespoon of olive oil and 1 tablespoon of baby shampoo on a plate. 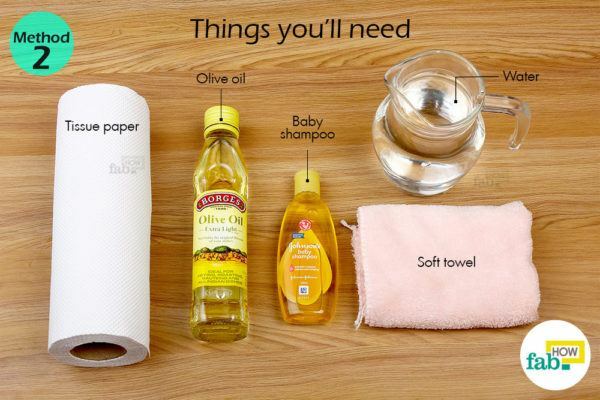 Baby shampoo acts as a mild cleaner, while olive oil helps break down stubborn oil-based makeup clinging to the bristles of your brush. One by one, move your dirty makeup brushes about in the oil-shampoo blend. You’ll notice different pigments or residues streaking from the bristles. 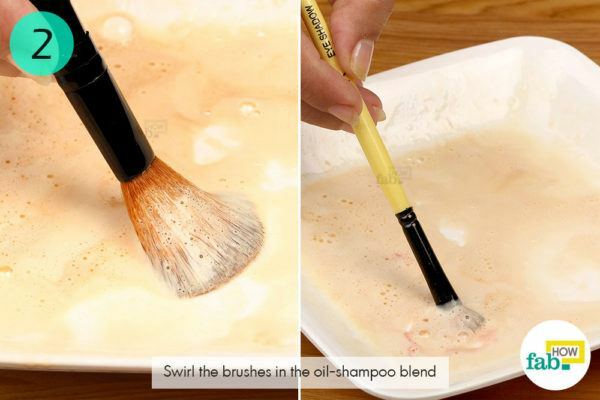 Swirl the brushes in a glass of clean water to rinse out the shampoo mixture. Lay the bristles of the wet brushes on a folded paper towel. 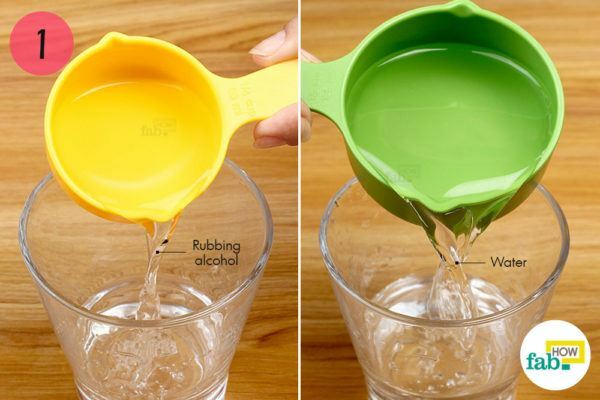 It will thoroughly soak up the dripping water. Then, lay the brushes on their sides on a soft, lint-free towel. Be sure to keep the handles of the brushes higher than the bristles, so that the water can easily seep into the towel. 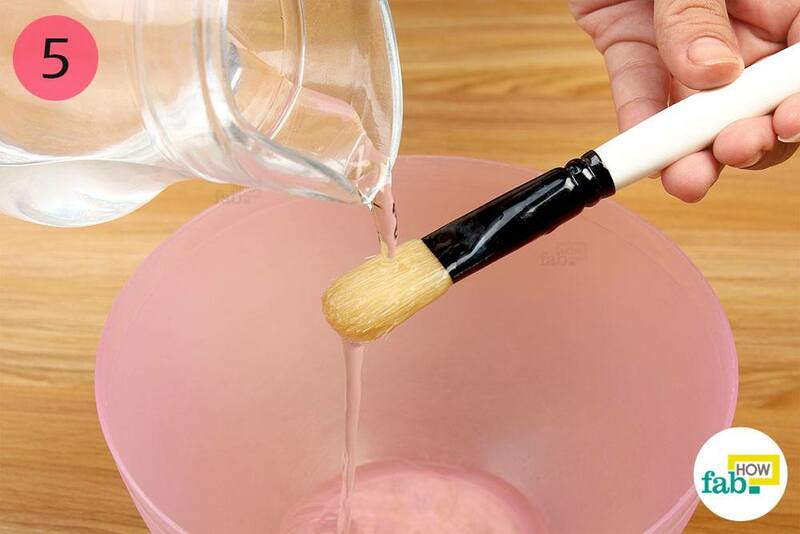 If you haven’t cleaned your makeup brushes in months, give this method a try to attack the germ buildup and sanitize the brushes. Measure ¼ cup of rubbing alcohol or isopropyl alcohol and pour it into a glass. 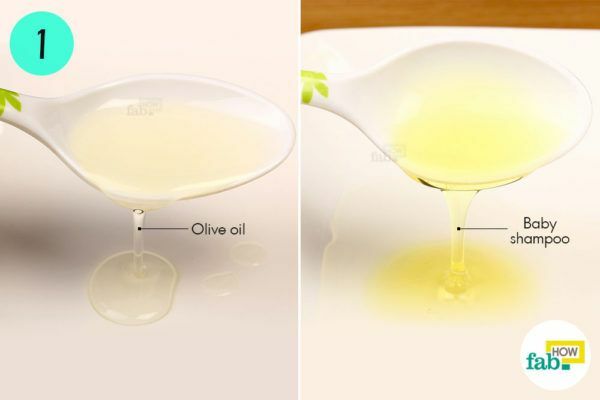 Add ½ cup of water as well. 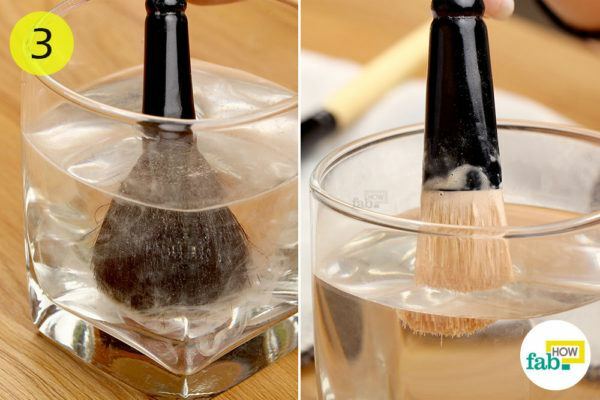 This rubbing alcohol solution works wonders by thoroughly disinfecting your makeup brushes. Swirl the dirty makeup brushes in the rubbing alcohol solution. Besides killing the bacteria, this solution helps remove stubborn pigments from your brushes. You may notice colors from old makeup streaking into the solution. For further cleaning, squirt a little liquid hand soap into a glass of water. Hand soaps usually have antibacterial properties that will further sanitize your brushes. 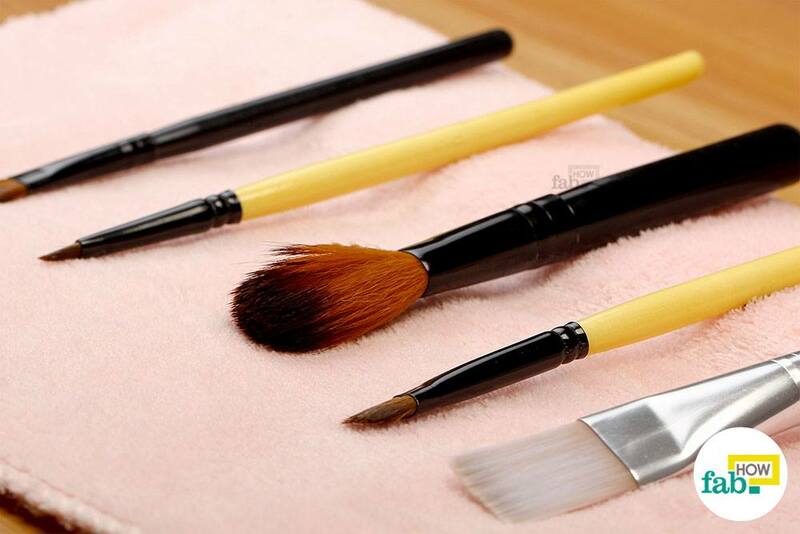 Use a mild hand wash.
Swirl the makeup brushes in the soapy water for some time to completely clean them. 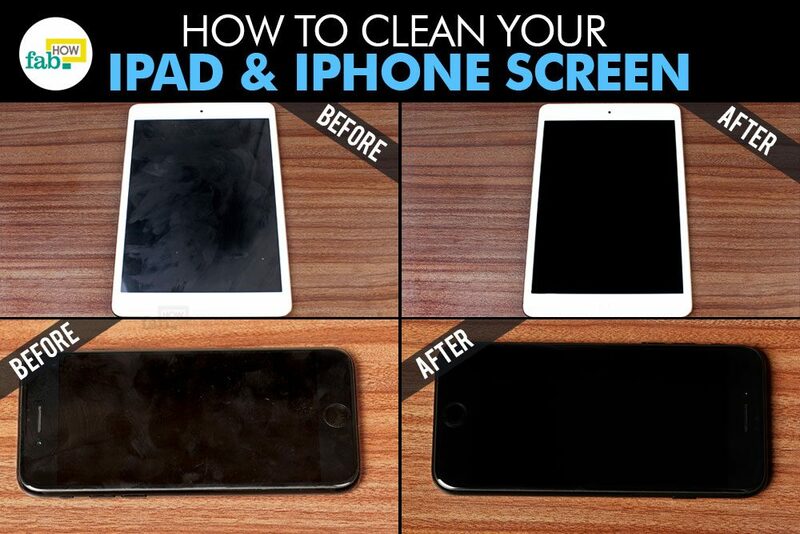 This will also remove any traces of rubbing alcohol. Rinse the brushes under a gentle stream of running water to clean out the remnants of the hand soap. 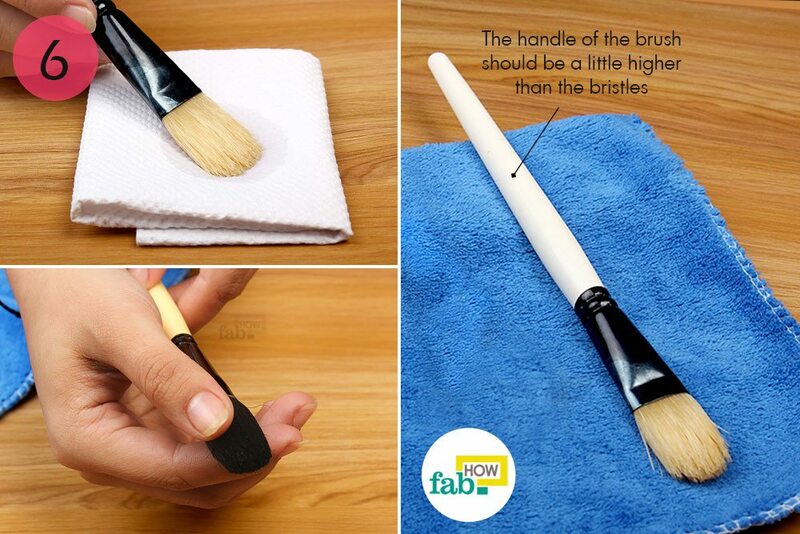 Lay the wet bristles of the brushes on a folded paper towel. It will soak up the excess water. Then, lay the brushes down on their sides on a soft, lint-free towel with the handles raised slightly. This will ease the flow of the water from the bristles into the towel. Let the brushes air-dry in a well-ventilated area. With your entire collection of makeup brushes cleaned, you can enjoy those beauty strokes without making your face dirty in the process. 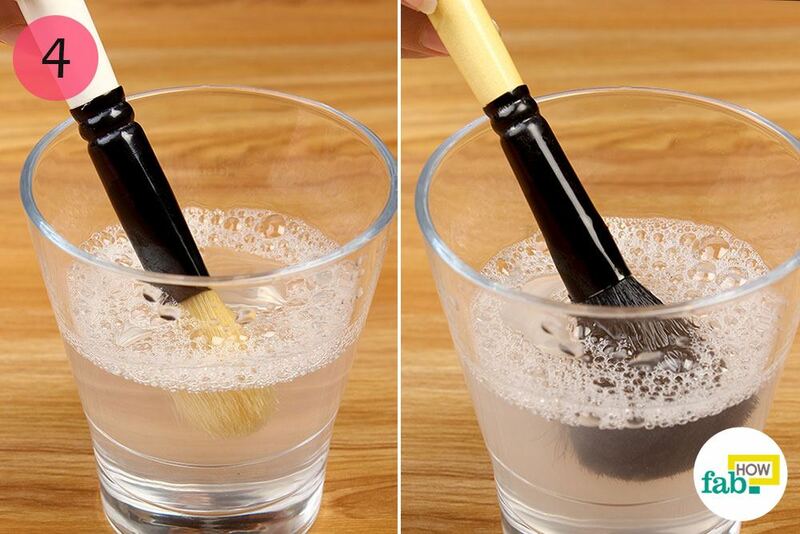 If you’re cleaning your makeup brush just with rubbing alcohol, it should be dry after about 30 minutes. Natural hair brushes can also be conditioned with a hair conditioner every now and then. Baby wipes and makeup removal wipes can be used when traveling to remove liquid makeup from the brushes. A few drops of tea tree oil or another essential oil can also be mixed with the baby wash to provide antiseptic properties and a pleasing fragrance. To avoid getting water inside the ferrule of the brushes, keep the bristles pointing down during the entire process. If water gets in the ferrule, it can loosen the glue that holds the bristles together. Wooden handles should be kept away from water as well.